Few know there’s a city named Zagreb, the capital of Croatia. It’s only after Croatia reached the World Cup soccer final, people take note of it. Croatia, with a population of just 4.2 million, is the smallest nation to reach the tournament final since Uruguay in 1950. It reached that point by coming from behind in the second half of three consecutive games, all of which required 30 minutes of extra time to settle (two on penalty-kick tiebreakers). As the jubilant French team was basking in the glory of their second World Cup title at Moscow’s Luzhniki Stadium, the downpour hid tears streaming from the eyes of the fallen Croatians, whose heroic run through soccer’s ultimate testing ground offered hope to every small country with big dreams. Croatia may have lost the most famous title of international soccer, but their terrific team spirit and incredible never-say-die attitude finally won. The amount of hearts Croatia won in Asia, Africa, Europe, North America and Pacific is amazing. As I was reading Croatia Week, which is published from Zagerb, I was moved by the comments made by a Croatian. Yes, the soccer team has proved Croatians are not the prisoners of bad news. “Sometimes we feel so alone. We are a small economy, our bureaucracy repeals foreign businesses. We feel alone even in Croatia, divided by the left and right and pro and against and class and income. It’s true people do manage to gather to oppose something or someone but rarely do we feel united in a positive way. 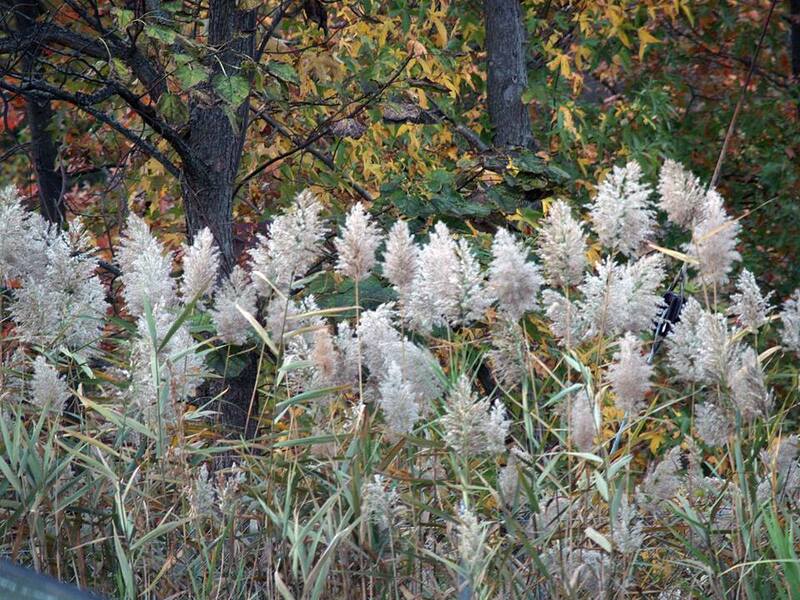 And that’s exactly what happened when all people united in unprecedented happiness and joy,” the Croatian commented. 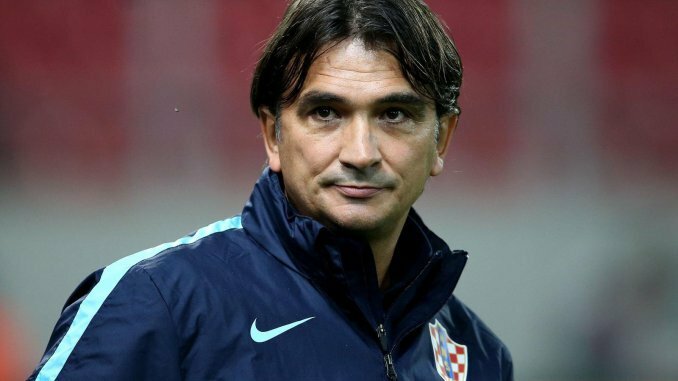 One person who especially stuck out was the coach, Zlatko Dalić. His incredible sense of measure and sportsmanship, even in most euphoric situations after major wins, always congratulating the opponents, never underestimating the next opponent, putting the team first when it comes to results, is amazing. What an incredible man! Lesson: The Croatians have taught that being humble, sportsman spirit and never giving up is the ultimate winner. When will Indian media come of age? 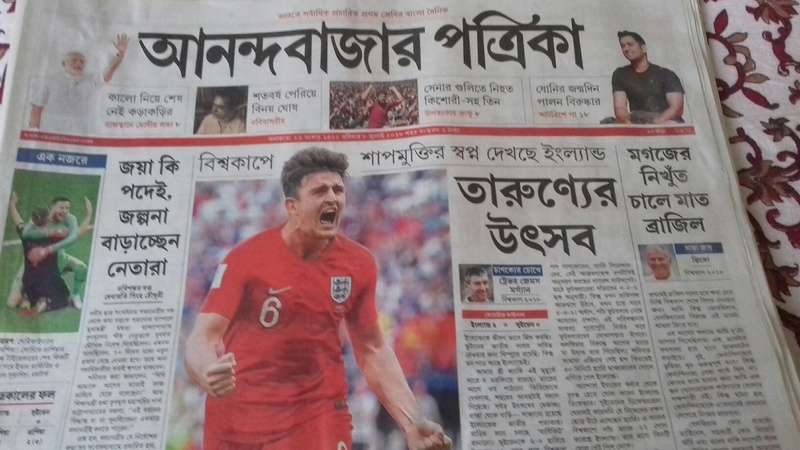 Has anyone noticed the media frenzy in India that began more than a month before the World Cup football began? 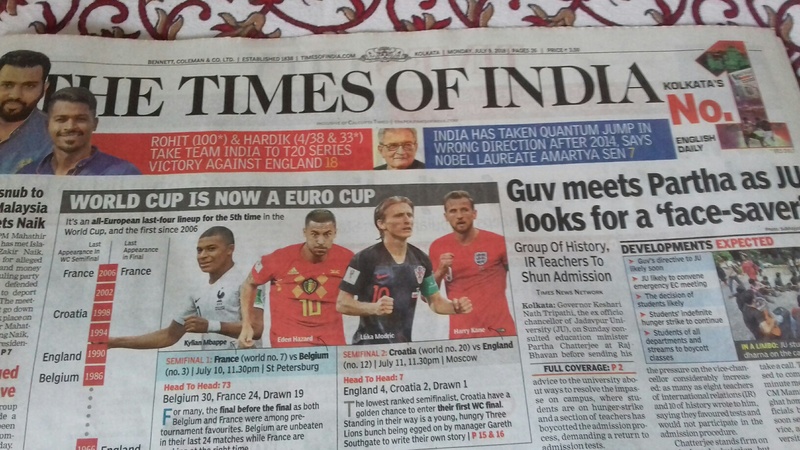 Has anyone seen that front-pages of all Indian newspapers are awash with soccer stories? You’ll come across this madness in India only. It’s not the first time that we’re witnessing this madness (there’s no method in this!). We are familiar with this fatuous infatuation with sport which comes every four year. Unfortunately, India’s football ranking is woefully poor (India currently ranks 97th). 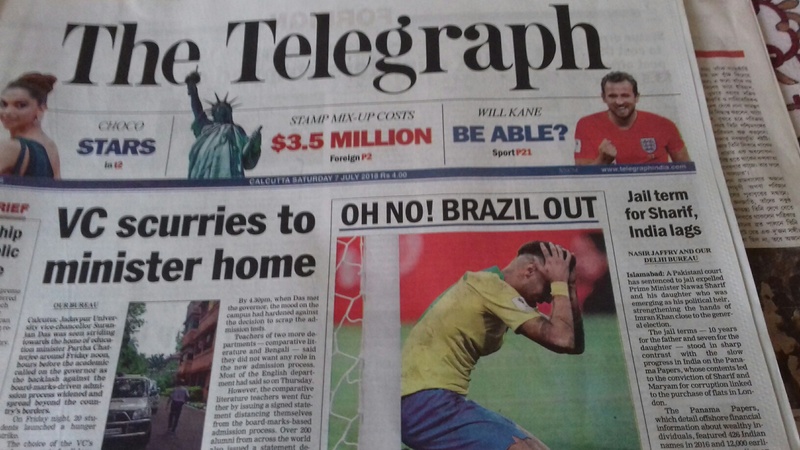 I wonder why Indian media has been going overboard year after year and carrying soccer stories on front page even though our country couldn’t even qualify now for the Asian Games. Aren’t there news worth reporting on front page? Can’t these stories be reported on Sport page? It reflects Indian media’s mediocrity and sheer immaturity. I’ve traveled in Paris when the French Open was underway. I was in New York when the US Open was going on. But, I’ve never come across the media’s such infatuation with sport. Le Monde, New York Times or Washington Post never reported sport news on their Front Pages during the French Open or the US Open. Those who watched Japan-Belgium tie will agree that Japan had played an unbelievable game. They lost in the dying minutes of additional time. It was a heartbreaking defeat for Japan. A win would have secured the team’s first-ever advancement to the World Cup quarter finals. But, the next day Japan Times, the leading English paper in Japan, didn’t carry the news of their country’s heroic efforts in the World Cup on its front page. The news was reported in Sport page only. I wonder what Indian media would have done if India did the same thing. All pages of newspapers would have been filled with sport news! Look at The Guardian. Even after England qualified for the semi finals after 28 years, the front page of The Guardian didn’t carry the news as lead story. A nation’s mindset and maturity may be measured on how its media think and what kind of role it plays. When will Indian newspapers come of age? Are you guys listening? Grow up, Indian media. Footnote: I was disappointed to see that Indian newspapers didn’t carry the news of Japanese team’s sportsmanship and fair play the way it should. FIFA General Director Priscilla Janssens tweeted a picture of Japan’s spotless dressing room after the defeat, praising the team and their fans for their tidy-up efforts and manners and also writing that the team had left a ‘thank you’ note in Russian for the hosts. Look at the Indian media. They’ve underplayed such sterling gestures by the Japanese players and fans. Shouldn’t Indian media highlight the news? This should have been on the front pages of newspapers. We should learn from the Japanese people. We should learn from their dignity in defeat.